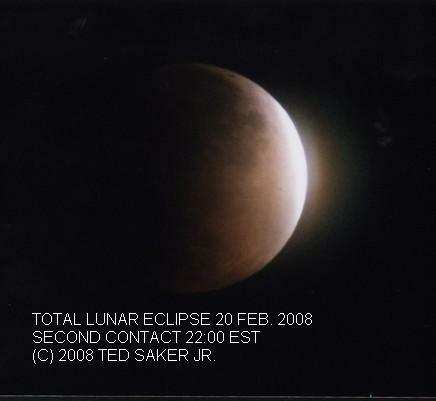 © 1998, 1999, 2000 Ted Saker, Jr. All Rights Reserved. How about a brief eclipse primer? Tips on Total Solar Eclipse Videography. Total Solar Eclipse, 11 August 1999: The Last Total Solar Eclipse of the Second Millennium. Partial Solar Eclipse, 25 December 2000: The Last Solar Eclipse of the Second Millenium. Totality! Nice picture of inner corona. Local Time 2:14 PM. Totality! Nice picture of solar prominences. Totality! Nice picture of polar brushes. Totality! Even the children got into the act with their 110 cartridge cameras! Two nice pictures of the outer corona. Third Contact! Notice the large prominences above & below the emerging photosphere. This picture was scanned from a 5x7 color rebalanced print by Lara Young of Chick's Camera Exchange, Worthington, Ohio. Lara did a nice job of bringing out the color of the prominences. Third Contact with the 110 camera. A chart of Captain Mercer's efforts to get us into clear skies and where we were at totality. Quite a few of my pictures are still waiting to be scanned. I got some decent video footage during the eclipse. Hopefully, I can do some video capturing. I have some nice shots of the outer corona with Jupiter and Mercury flanking the eclipsed Sun, and also shadowbands! I took the video with a JVC VHS-C camera. I was a part of a group consisting of about 10 members of the Columbus Astronomical Society and about 30 members of Amateur Astronomers, Inc. of New Jersey. The day before the total eclipse, I delivered a presentation on videotaping total solar eclipses at the European Southern Observatory in Garching, just north of Munich. The schedule for the symposium, Research Amateur Astronomy in the VLT Era, is on line. Thank you to the European Southern Observatory for the use of the schedule document in html form. See Session VI, Tuesday August 10, 14:55-15:10. David L. Crawford of the International Dark Sky Association delivered a very important presentation about light pollution. See Session IV, Monday August 9, 15:30-17:00. Bill Kramer took a picture of me during my presentation. Thanks to Bill for permission to use this photo. Our group observed totality from a soccer field near the Bavarian town of Altomunster. The weather prospects for the day did not look good judging from the view to the west. Between first and second contact, we got drenched twice. The rain did not help us getting things set up. I had extreme difficulty locating the sun in the telescope. What light my solar filter did not block the clouds seemed to obscure. However, with true German efficiency, a hole opened up about a half hour prior to totality, then closed up about ten minutes after totality when a thunderstorm came through. As a result, pictures of first and fourth contact were hard to come by. At second contact, I was shooting videotape of the shadow's approach. I ran out of film just before third contact but I took some very nice video footage of third contact and the shadow's departure. Totality! Beautiful picture of solar prominences. Totality! Another beautiful picture of solar prominences. Totality! Exquisite picture of the outer corona. Notice the details in the coronal streamers. Totality! A very nice picture of the inner corona, showing prominences and structure. A post-totality and pre-deluge group picture of happy CAS eclipse chasers. Another succssful hunt! Thank you to Bill for permission to link to this picture. A Christmas miracle happened in Central Ohio: clear skies in late December! However, clear skies on a winter day means cold temps. This Christmas Day was no exception. It was a "great" eclipse as it was visible for the entire duration from my backyard. The only eclipse chasing I had to do was walk out the back door. Here's a picture of my nearly snowbound rig in the backyard. My Minolta X-370 is notoriously fickle in cold temps. Don't let the bright sunlight fool you: the temps never broke 20° F. I had to unmount the camera after taking each frame to ensure that the dang thing would continue to work. Asthetically and scientifically, it's hard to get worked up for a partial eclipse. Trying to do something new with my images was my challenge. I thought to myself, self, why not animate the still pictures to show the moon's motion across the face of old Sol? Here it is: Ted's Partial Solar Eclipse Animation! Each frame was taken 15 to 20 minutes apart beginning at about 11:10 AM local time (EST). Pixar hasn't anything to worry about from this effort. I have to admit that I haven't been doing much in the way of eclipse chasing so far this century. However, I did manage to capture one (1) decent image taken seconds before second contact on a very, very cold winter evening in Ohio. Check out the other pages on this site for CCD images and other astrophotography.